Get inspired by these beautiful, glamorous and elegant Great Gatsby theme party decoration ideas. Whether it's extravagant feathers, vintage gold and black, or expensive pearls - they were so popular back in the roaring 1920's fashion. Do you have an awesome Great Gatsby idea too? Add it here. 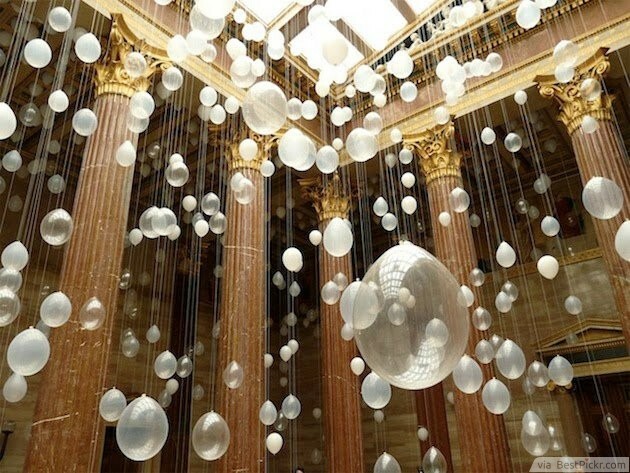 Used creatively in a large chamber, hanging balloons can create a spectacular atmosphere. 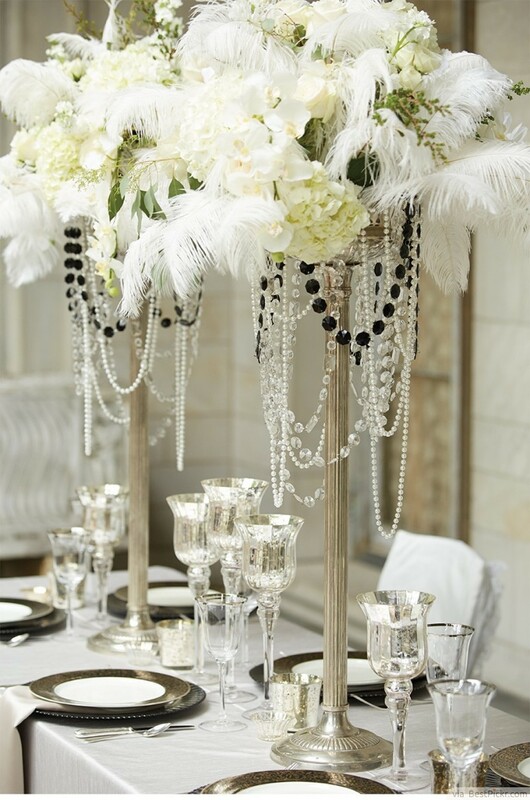 Go with white or transparent balloons for a wonderful effect that will outshine even the most opulent candelabrum. Or how about these great party lighting ideas? Feathers are a massive trend within the Great Gatsby style, so they’re a must-have for themed party decorations, weddings, Christmas or New Year celebrations. Bigger is always better with this idea, as large centrepieces look very striking. Intersperse them with other decorations or leave them on their own to channel some vintage glamour into your Great Gatsby themed soirée. Of course, feathers don’t just have to be left to the décor. They’re ideal for incorporating into the entire theme, including the costumes and even the food! White is a classic colour which can tie in with any other palette, so choosing such simple yet flamboyant flourishes will definitely add class and style. 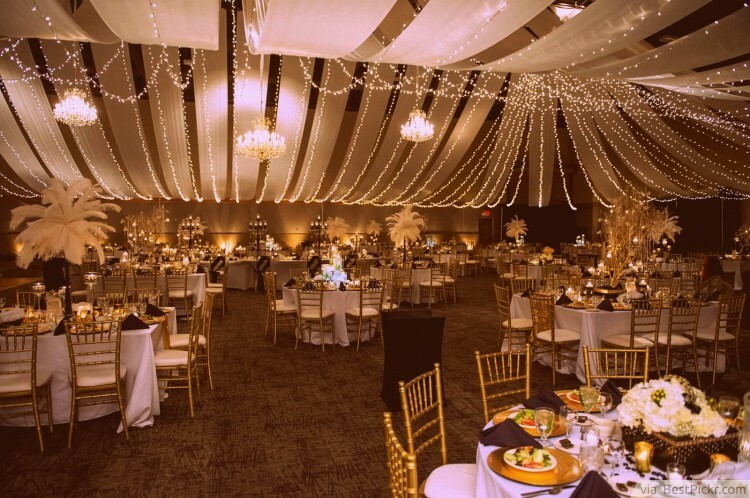 For a true vintage glamour feel at any Great Gatsby themed party, lighting is key. Keep it soft and warm for a comfortable, luxurious atmosphere. A fantastic idea is to use string lights on every possible surface, or try these amazing pendant lighting ideas outdoor. Not only are string lights fun and pretty, but they resemble dripping crystals - perfect for the sumptuous ambience that you're looking for! Nothing says vintage glamour Great Gatsby style like a room filled with strings of dripping pearls. This is a brilliant idea if you're looking to add an extremely extravagant feel to your party, but with little expense. Drape pearls from the table centrepieces, over the chair backs and all over the themed outfits. One important thing to remember with this idea is that you can never have too many pearls! Ramp up the vintage feel at your Great Gatsby themed party by including strings of pearls anywhere and everywhere! Fancy a drink? 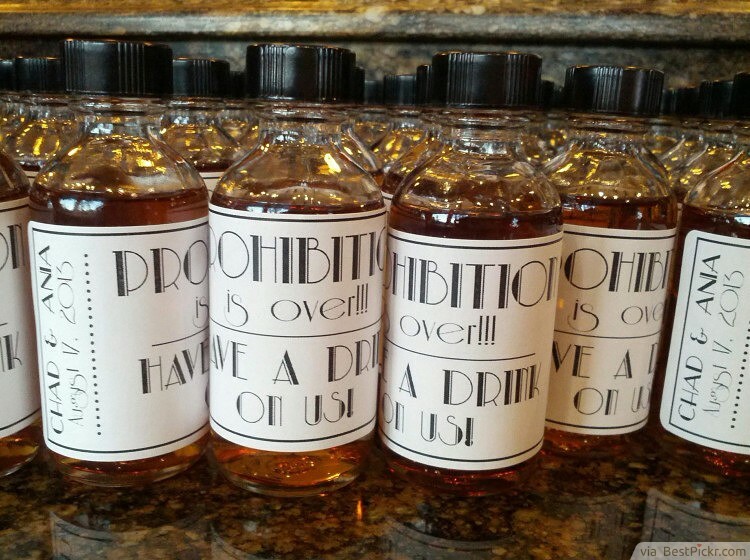 Personalized bottles are one of the best Great Gatsby party ideas you can play with, whether you want to make fun of the controversial historic prohibition of alcoholic beverages that took place in America from 1920 to 1933, or Gatsby’s reputation as a bootlegger. 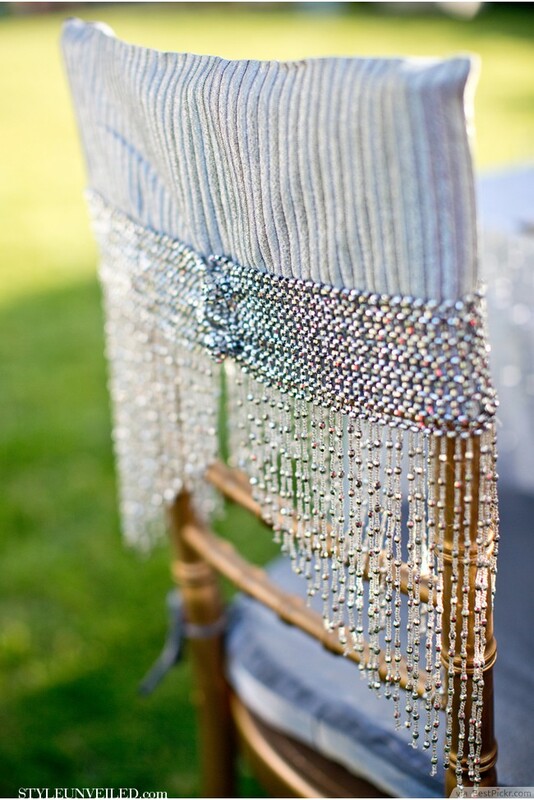 Add glamor to your Gatsby party with these beautiful chair decorations. The glass beads are a cheap but stylish way to enrich the setting and make the ladies feel like they are sitting on the chairs on which Daisy Buchanan or Jordan Baker had once sat. 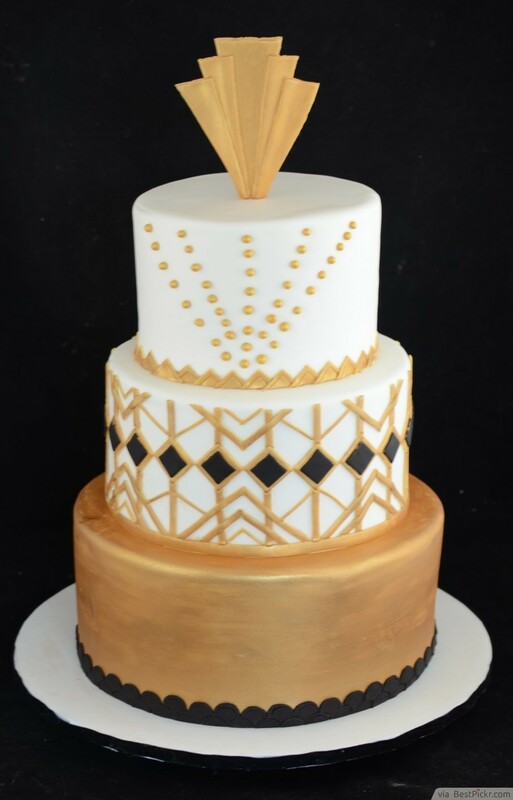 Art deco themed details will turn Great Gatsby parties from being average to being spectacular. This idea will bring the vintage feel to life, as art deco styling was everywhere during the 1920s. 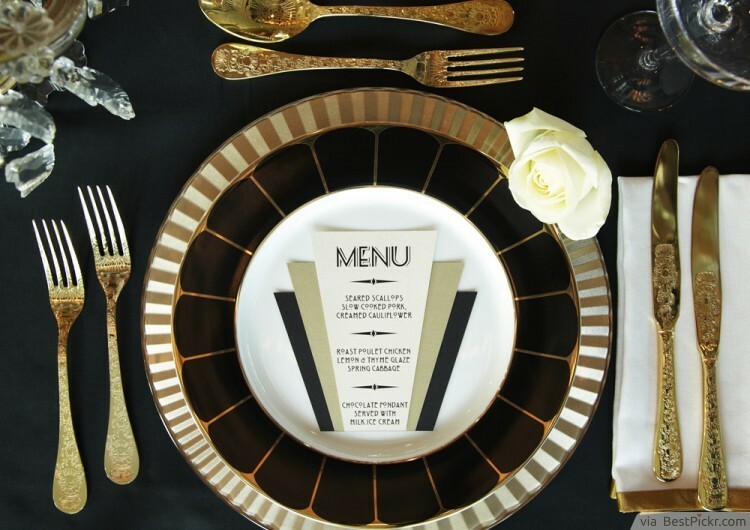 Include the iconic fonts and geometric shapes in your invitations, decorations, table arrangements and more to transport your guests straight back to the roaring '20s. 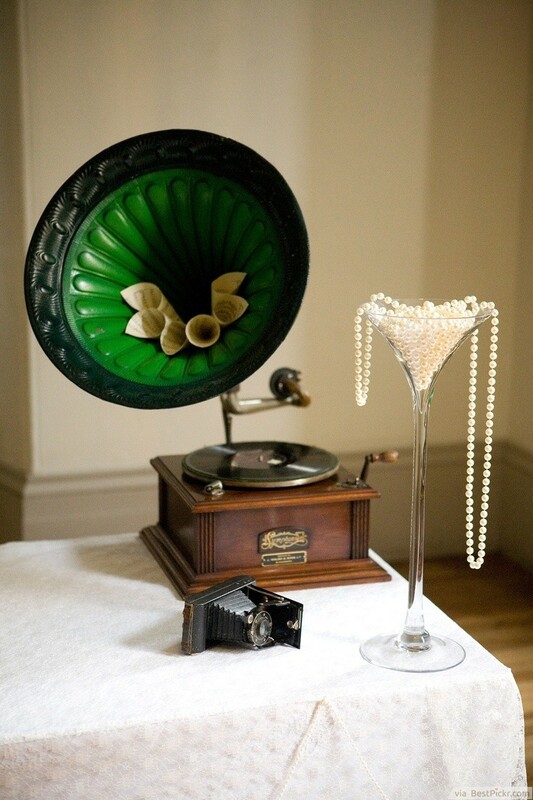 A glass of pearls, a gramophone, and an old-fashioned camera will help you bring the flavor of the Jazz Age to your party. 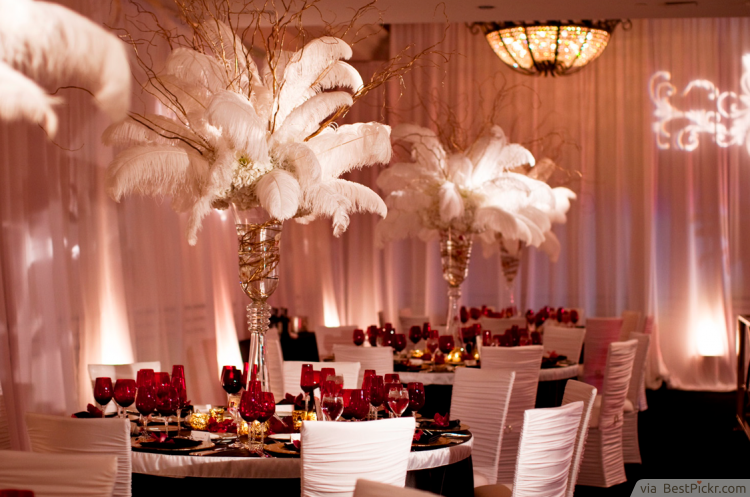 Use white table covers for a striking contrast. 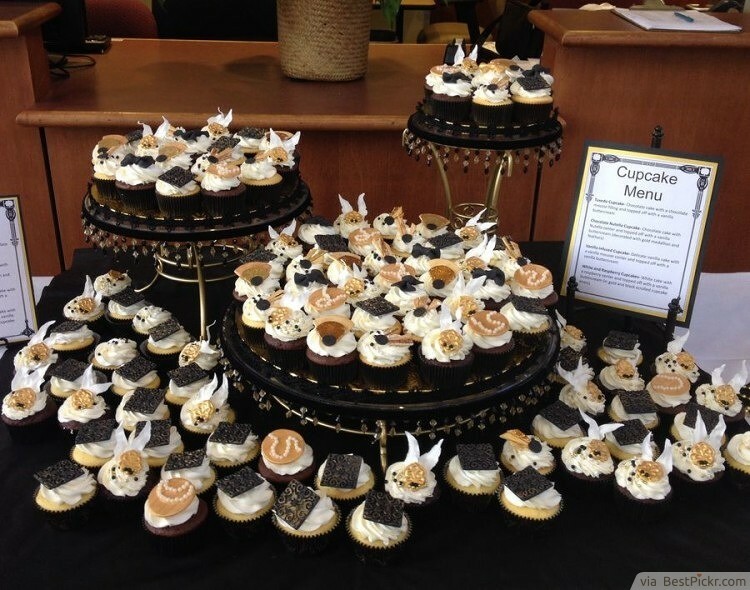 No Great Gatsby themed party food decoration can be complete without some delicious chocolate and vanilla cupcakes adorned with tasty ornaments and served on stylish tableware. Notice all the fine details. Yummy! What could be more glamorous and exquisite than bright, metallic gold? The juxtaposition of extravagant gold elements with matt black details is incredibly striking, and it was typical of the Great Gatsby era. A themed party will always seem more realistic with the combination of black and metallic gold (or even silver), so include it in everything. It's both easy and effective to use these colours in the decorations, the outfits and even the food!